We have carved a niche for ourselves as a well-known Exporter, Importer and Supplier of Titanium Flanges in Maharashtra, India. We have tie-ups with the renowned manufacturers who are famous for the quality that they offer. We make sure of premium quality raw material for their production. As a result, they comply with all the stated industry-specific norms. They are extensively used in chemical processing and marine industry. 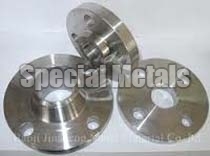 The Titanium Flanges are widely acknowledged for their longer service life and resistance against corrosion.